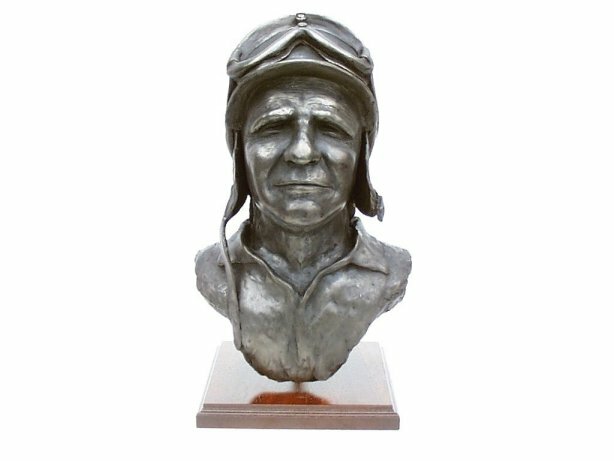 I have to admit it Fangio is my hero, not only was he supreme in his ability as a driver, he was also incredibly tough and determined often winning races in broiling conditions when other drivers were forced to retire with heat exhaustion. 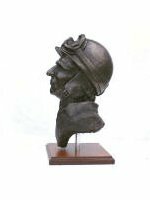 Above all he was a gentle modest man, encouraging to his younger team-mates and would walk to the back of the grid to welcome a newcomer in their first Grand Prix. 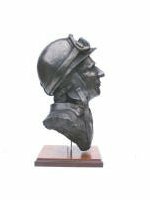 Fangio won his five world championships at a time when driver safety was of no consideration and men manhandled their bellowing machines on tracks without barriers and gravel traps where precision was everything. 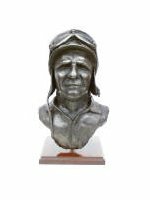 Despite his fame and adulation Fangio remained a simple man and a gentleman. Never has there been a better ambassador for the sport. 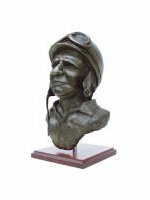 This cold cast Bronze Fangio Bust is made entirely by hand by sculptor Peter Close in his studio in Somerset.